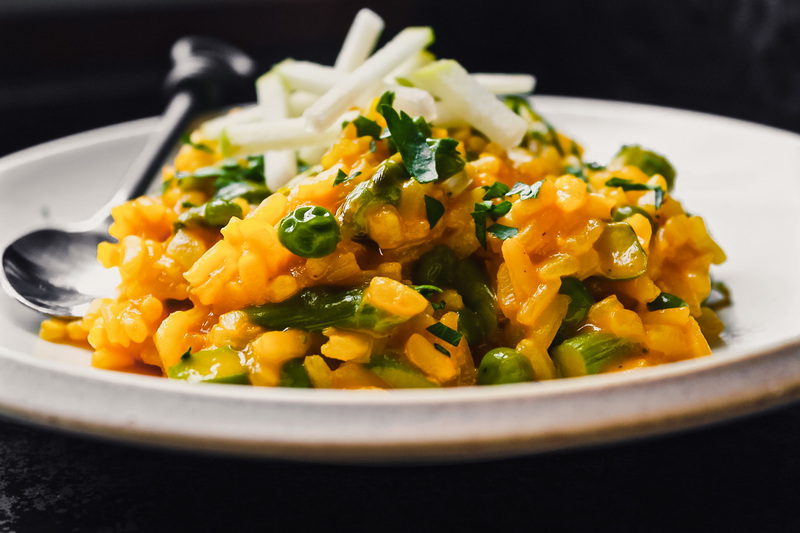 Carrot Risotto—healthy, comforting, colorful and just downright delicious. I’m officially here for it and I think you will be too! Risotto is one of those dishes that can feel pretty heavy. And depending on how it’s made, it can be. But here’s the thing, risotto can be creamy, comforting, and delicious all while not breaking the bank when it comes to health. If that’s not a win I don’t know what is. Vibrant, packed with wholesome ingredients and easy to make, this recipe is perfect for weeknight dinners in spring! This carrot risotto is made with 100% carrot juice and chicken (or vegetable) stock. 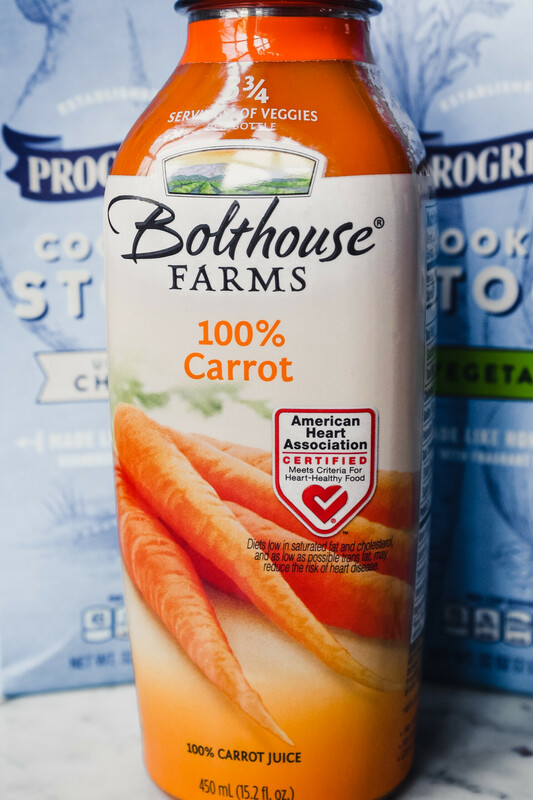 The carrot juice not only creates a beautiful risotto but also adds an earthy sweetness that pairs perfectly with a hint of Parmesan and rosemary. And where there are carrots, there must be peas—right? 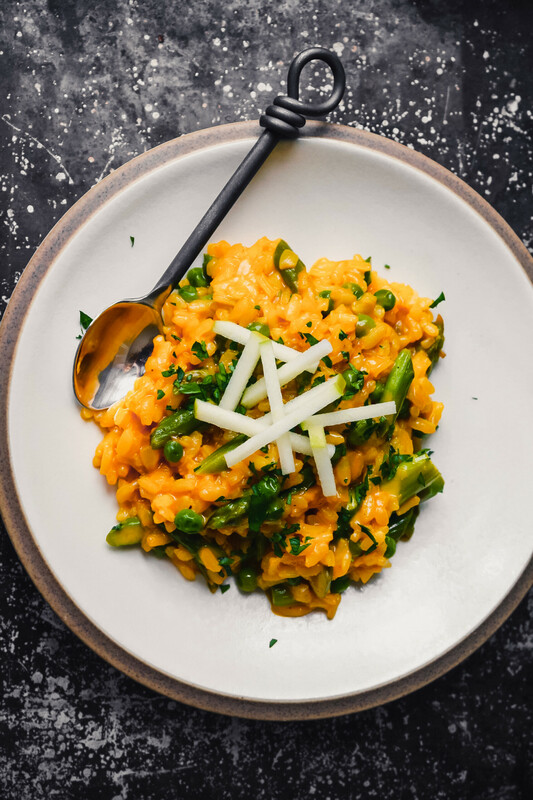 I decided to add some bright green peas and tender asparagus to this carrot risotto to add a contrast of texture and flavor. They also are essential for taking this carrot risotto from side dish to entrée. 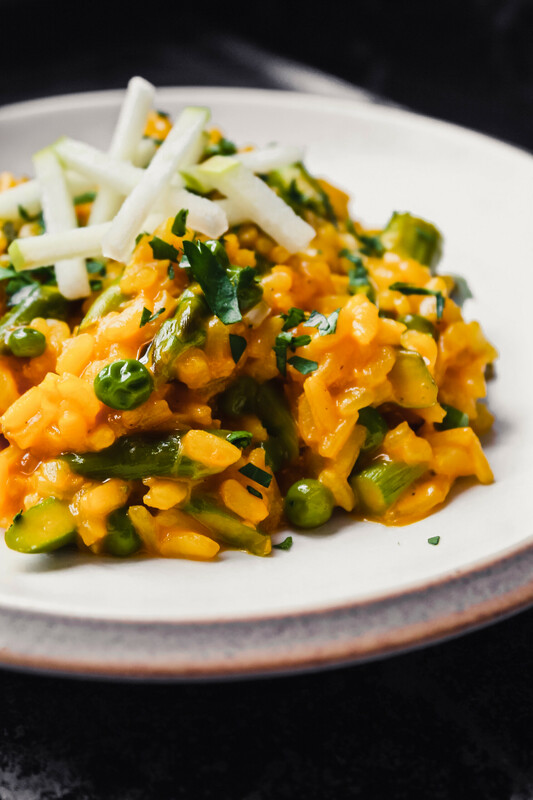 I serve this gorgeous veggie risotto with fresh parsley and a touch of crisp green apple for a bit of sweetness—it’s a must! LOVE risotto?! Check out more great risotto recipes! 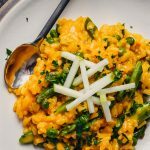 Creamy, vibrantly colored, and packed with veggies, this Carrot Risotto is as delicious as it is gorgeous! Bring stock, carrot juice, and water to a simmer in a medium saucepan over medium-low heat, cover and keep warm over low. Heat 1 tablespoon olive oil and 1 tablespoon butter in a large pot or Dutch oven over medium. 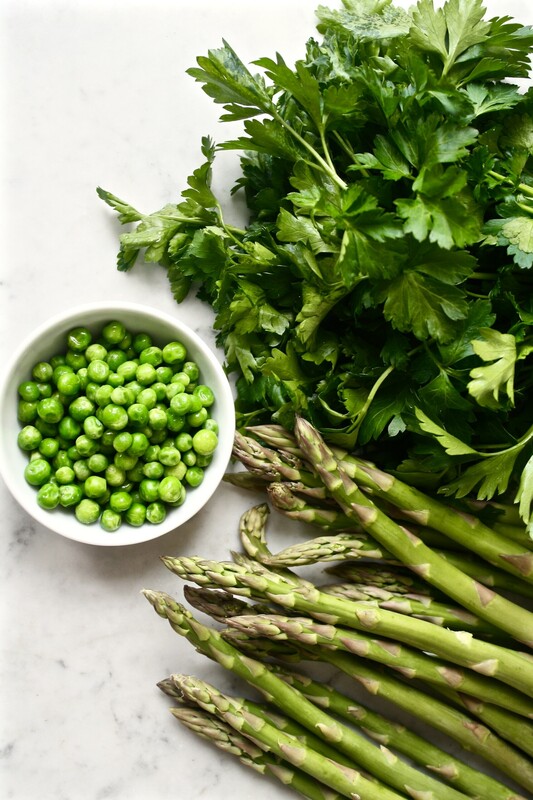 Add asparagus and cook until crisp-tender, 4–5 minutes. Add peas and cook to heat through, 1 minute; season with salt and pepper. Transfer vegetables to a bowl and set aside. Heat remaining tablespoon olive oil and remaining tablespoon butter in same pot over medium. Add onion and rosemary and cook until softened, 5 minutes season with salt and pepper. Add garlic and cook until fragrant, 1 minute. Add rice and cook, stirring constantly, until grains are slightly translucent and milky in color, 3 minutes. Add wine and cook, stirring constantly, until liquid is absorbed, about 3 minutes. Stir 1 cup warm stock-carrot juice mixture into rice, and cook, stirring constantly until liquid has been absorbed, 1–2 minutes. Repeat adding 1 cup stock mixture to rice and cooking until liquid has absorbed. Continue adding and stirring until all of the stock mixture has been used and the rice is creamy but al dente. Reduce heat to low and stir in reserved vegetables, Parmesan and nutmeg; season with salt and pepper to taste. Serve risotto with additional Parmesan, green apple and parsley. Replace the 2 tablespoons of butter with olive oil and leave Parmesan out. Optional: you can use nutritional yeast in place of the Parmesan. We have now made this recipe 3 different time, and it has never disappointed. I love that it is tasty and made with wholesome ingredients while also being straight forward enough in the preparation that even a not-so-confident cook like me can handle it. Thanks Lauren! Hi Lainee! I’m so glad you have been enjoying it, it’s one of my favorite recipes! 🙂 Thanks for leaving a note!